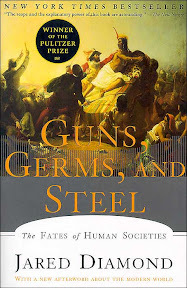 One of the biggest issues I have with the book Guns, Germs, and Steel is its name. Other than act as an intermittent rallying cry, the title does little to summarize the arguments presented by Jared Diamond as the underlying reasons for broad developments of human history across the ages. Instead calling it Geography, Technology, and Germs may as well remove the need for a longer synopsis. Agriculture and the domestication of animals was the key in stabilizing human societies, supporting villages and cities through productivity, thereby freeing people to specialize it trades other than food gathering. Geography is the deciding factor in the emergence (availability of edible plants and domesticable animals) and spread (agriculture spreads well along the same latitude in Eurasia as compared north-south in the Americas) of agriculture. Development of cities was key to increased human densities, leading to the growth of communicable diseases and corresponding immunity in peoples over time. When two civilizations meet (fight) the prevailing civilization is almost always predetermined by their level of technology (guns and steel - resulting from their head start in establishing cities) and their susceptibility to diseases (germs - determining whose diseases are deadly to whom). Admittedly, these are a ideas that are really powerful and useful in their own right. By establishing the precept that geography could play such an integral part in the growth of societies, the author is able to take the conversation away from specific human abilities to broad inevitable cultural movements. And the large number of examples do go a long way in supporting the arguments in the book. Some have criticized the book for being too deterministic or fatalistic. But it is in being so oriented to cause and effect, but identifying a substantially new cause is the strength of the book. What the book is also successful is doing is provide a language to interpret the large conquests of history, in terms of the key abilities of the warring factions. Be it the story of the Conquistadors or the rise in European powers, the book does a decent job in explaining them through the ideas of guns, germs and steel. That is not to say there aren't gaps in the narrative - the biggest being China. For a people to develop almost along a parallel path with little outside influence, while bucking the trends of social development outside, China presents a unique juxtaposition to the deterministic sense in the rest of the book. While the author acknowledges this and provides some context, it stands more as an example to what can be done despite the geographical realities of a people. The biggest issue I had was, the way technology was used to answer a question about technology. The author begins the book based on a question asked of him "Why do white people have so much cargo, but we New Guineans have so little?". Cargo here referring to the riches of technology. By answering that question with guns & steel doesn't help. Instead, if one were to take those out of the equation what remains is germs and geography, which is probably too simplistic. As a racially agnostic way of parsing and understanding world history, the book is a definite winner. But to not consider any human achievements into the mix tends to leave quite a few open questions.